Whilst dwarfed by nearby Mount Atago 愛宕山 (408 m) the highest mountain in Chiba Prefecture, Mount Nokogiri 鋸山 (329 m) affords some of the best views over Tokyo Bay while preserving a rich Buddhist history. 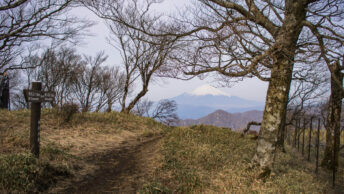 Access to Mt. Nokogiri particularly if coming from far flung West Tokyo does make the trip down to the Boso Peninsula somewhat wearisome. Options include heading via Yokosuka and taking the Kurihama-Kanaya Ferry (Tokyo Wan Ferry) or traveling via Chiba to Hamakanaya Station (JR Uchibo Line). The appeal of a six hour round trip made the decision an easy one and opted to break the hike over two days by spending the first night at Shioiri near Yokosuka Port. The following morning I made haste for an early train and bus to coincide with the second ferry departure at 08:30. All was going well until an announcement alluded to some maintenance issues which meant disembarking and waiting around the departure lounge. Given the two hour ferry delay I decided to make a beeline for the ropeway. From the Hamakanaya Port walk straight ahead, and turn right for an easy 15 minute walk along route 127 to the ropeway terminal. Alternatively if you prefer to give the ropeway a miss, a popular hiking course follows the Kanto Fureai Trail 関東ふれあいの道 which scoots under the railway line and follows an easterly path over the sawtooth range finishing at Hota Station. As written about previously on this blog, the early 1960’s brought with it a flurry of development across Tokyo prior to the Olympics including a large scale construction of ropeways or aerial tramways. The Nokogiri Ropeway 鋸山ロープウェー opened in 1962 two years after the Okutama Ropeway and two before the Mitsumine Ropeway near Mt. Kumotori. Apart from the addition of new cabins in 2012 the ropeway stations look unchanged since the first day of service. The ropeway runs at 15 minute intervals and a round trip ticket costs 930 yen. The upper ropeway station offers impressive views across Tokyo Bay towards Mt. Fuji and Izu Oshima Island. Admission to the Nihonji Temple complex costs 600 yen and with sealed trails and stairs makes it a family friendly day out. First stop is a tall, hand chiselled rendering of the Buddhist Goddess of Mercy etched into the stone wall. At over 30 metres high she marks a formidable presence and with her right hand beckons you forth to inspect the intricate carvings. During the 14th to 18th centuries Mt. Nokogiri was turned into a veritable quarry, supplying much of the local stone used during the Edo or Tokugawa period. Next stop is the Jigoku Nozoki or colloquially known as “View of Hell”, a jutted rock precipice that seems to defy gravity. From here a path heads down to the mountain’s other piece de resistance the 31 metre high Nihonji Daibutsu – the largest pre-modern stone carved Buddha in Japan. Built in the late 1700’s the Buddha underwent significant restoration in 1966 to repair earthquake damage still evident on its left knee. Sitting at the picnic tables makes it a great place to enjoy the quiet surrounds over lunch. The final trail loops by the 1500 hand-carved Arhat sculptures though now only tally 538 with many surviving statues missing heads due to an anti-Buddhist movement during the Meiji Period. Taking a right turn follows a steep stair climb back to the ropeway station. You certainly picked a beautiful and clear day to go on your adventure! Mid December often throws up some beautiful clear skylines across Kanto and was thankful to score one of them on this day.